After all of the rave reviews, I should not have been the least bit surprised, but I was shocked at the performance of this piece. The sports car analogy is very apt. 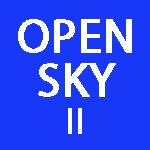 The Open Sky 2 handles like a dream. I have been playing soprano for nearly 40 years and have never enjoyed my horns so much. It is magic on the R&C Saxello. Thank you for sharing your genius and artistry.